Consider that you are staying away from home, what is the thing that you would miss the most? For foodies like Saurabh, it most probably is home cooked food. In this age of fast foods being delivered at your doorstep, this young entrepreneur has floated a startup, which offers a hassle free experience to consumers, when it comes to home cooked healthy meals. It is an on-demand, food delivery startup with a special focus on healthy, home-cooked food, which one can eat on a daily basis. Currently operating in Kolkatta, the startup already has several users on its platform. The aim of Saurabh is to remove the crisis for many who are in a situation where there is no time to cook and eat healthy. JabWeAte is an on-demand, food Delivery Company, launched its operations in Kolkata, earlier this year, with a special focus on healthy desi-style, home-cooked food which could be eaten on a daily basis. Keeping in mind the virtues of ‘home cooked food’, JabWeAte offers perfect meal solutions that cater to a cross section of individuals. We started an initiative to give recognition to those who are enthusiast about cooking but have no platform to show their talent. Its called “Be Your Own Chef” where anyone can register themselves as a “Chef” for JabWeAte. When they get the order, they will cook; our delivery boys will visit their home, pack the food and get it delivered to the customers. These Chefs gets paid for whatever they cook on a monthly basis. 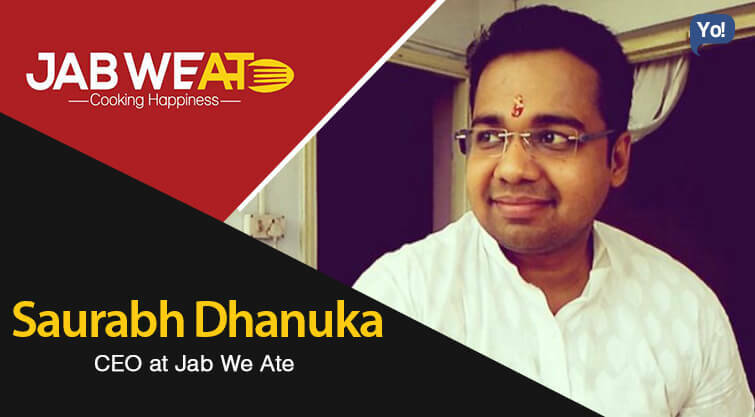 Someone told me one day, “Love cannot be described, it must be tasted”, so I came up with an initiative to fill the hungry bellies with most relished home-made food and that is how JabWeAte was started. I have my own reasons of giving birth to JabWeAte. I always wanted to work on something where solution doesn’t have a problem but problem has a good solution. I have worked in an IT industry and I have seen people craving for good home cooked food at even 10 PM in midst of client calls. I wanted to fill this gap between hungry bellies and good home cooked food. Secondly. I wanted to be responsible for my own success and failures. Thirdly, more than 1 Billion Population of India is itself a very big opportunity. If plan A doesn’t work, the alphabet has 25 more letters. Keep working hard!! Be a doer, not only a dreamer. The biggest challenge in this industry is serving good quality hot food with complete freshness. At JabWAte, we work on a zero inventory model and start cooking food only when the order is placed, avoiding any kind of wastage. Hence, the food is cooked fresh every day, and that is what makes us stand out in the crowd. Second most challenging factor is retaining of delivery boys. It was not at all easy to find people who were good with road sense as well as educated enough to operate smartphones. There has been lots of time where I have myself went to deliver food to customers. We did lot of R & D to overcome these challenges. The first step was to cook fresh food everyday. We decided that we will cook only when the order is placed. Serving hot and fresh food to your customer has its own advantages. Secondly motivation is key for people and apart from commercial interests, freedom of working on your own way becomes very important i.e. to do things the way they want. We taught the delivery boys the advantages of using watsapp and sms. They appreciated the fact and understood the efficiency of these technologies. I have self funded it and as of now not looking for any kind of investment. Of course I have my friends and family to support as and when required. If required, we will go in for funding by end of financial year. Currently we are a small team of 5 members. I have always believed in working like a family and was always sure to give my people the freedom to work on their own. I have always wanted to experiment them with new ideas going beyond the set of rules. Whenever we grow as a team in terms of numbers, I will avoid any type of hierarchical structure. I believe these structures restricts people’s mind and the process becomes much slower than usual which will affect the efficiency and productivity of the company. We being a start up cannot afford to follow the principles of slow and steady winning the race. With more and more technologies coming in, competition is bound to grow multiple folds. In terms of attrition, I don’t want to keep any attrition control practices. Its all about matching your wavelength with your staff and employees. 1.) Being passionate is very important in life. If you are passionate about what you are doing, even putting your luxury on risk becomes smoother. 2.) Patience is a key to fight against any challenges that comes your way. 3.) Team Work : It makes work faster and more efficient. I have taught my delivery boys to use Google Maps as it helps them to locate the consumers address to deliver food on time. Also I send them address and name of the client on watsapp messenger. It helps in storing the data of the consumer too for future use. Apart from these, I use excel sheets to maintain all my financials and consumer data. When someone says you will not be able to do something. Trust me, I can’t rest until I complete that task. Since the time I have stepped into my corporate world, I have always kept a diary with me. Prioritizing my work is what gets the most of me. Knowing what task is to be done when and how is very important. Getting over tensed. I get over tensed when things take a wrong way. I need to learn to keep calm. Whatever you do should make you feel happy. Everyday you should have a motive to wake up in the morning. You should always do 1% things extra than what you did yesterday. Depending entirely on technology. People believe e-commerce is everything and going on only mobile is a big thing. I will never let JabWeAte go only on mobile apps. Catering to every type of audience is a key to success. There are people who still feel calling and ordering for food is most effective and efficient way. There should be a balance between personal and professional life. Spending time with friends and family is very important. It is the most relaxing and the best stress buster. By the end of 2016, We plan to expand our operations into 3 more cities. We will be introducing more options to our customers so that they can enjoy exotic delicacies served hot and fresh at their homes itself. I personally feel in the saying that “change is the only thing constant” and so we have decided to keep on doing something or the other to be keep our menu and business model exciting. I would directly like to start my own venture rather moving to corporate world first.